Easy and Kawaii (cute) decoration for your Christmas cake! 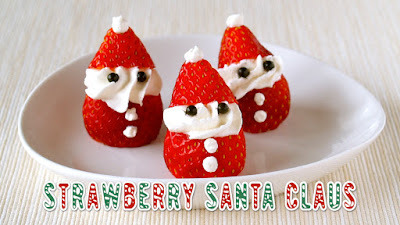 There are many strawberry santa ideas on the web but I would make it like this! 1. Cut off the stem end of the strawberry, and slice across about half (hat side bit smaller but not too small). 2. Use a star tip, pipe the whipped cream between the cut strawberry. Cut the tip of another pastry bag to pipe the buttons and pom pom ball on the top of the hat. 3. Attach tiny chocolate candies for the eyes. Or you can use a chocolate pen or melt chocolate in a pastry bag and snip off the end to draw the eyes.